As announced a few weeks ago the Shed is going to embrace Frostgrave in 2016 which does mean a whole new terrain project...hooray. I have tried snowy landscapes before a failed quite miserably so this to all intents and purposes is going to be a fresh start. 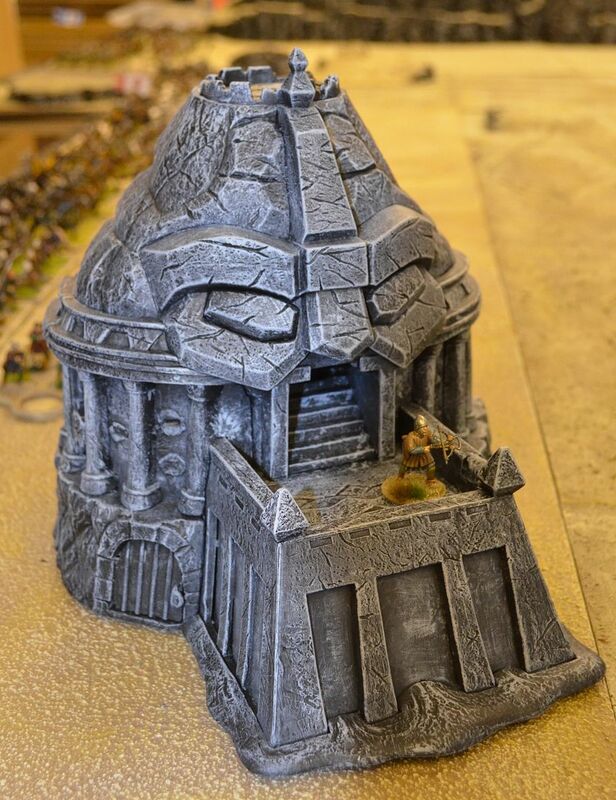 All credit to him for this build and alerting me to the possibilities of the Gormiti Building...read on. The starting point on any journey is to do some tests. 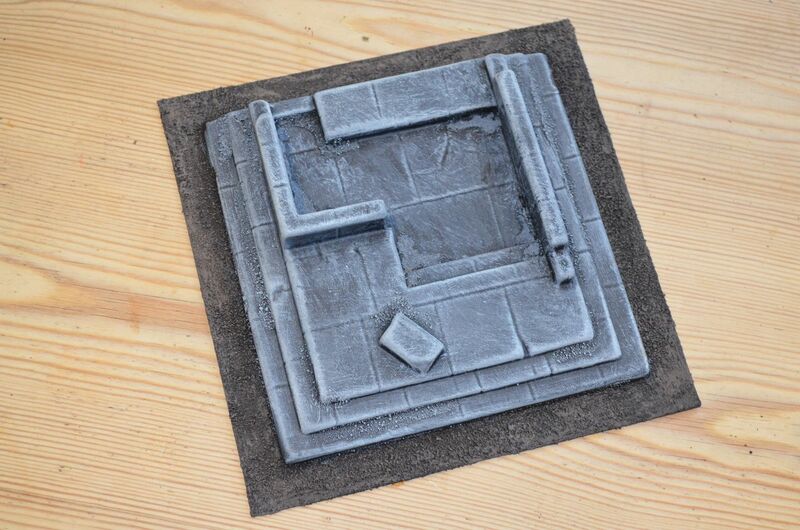 As part of my Amera order I purchased a small flat terrace - its about 6 inches square and perfect for my first test. This was initially primed in grey paint then painted black. The ground surrounding the plinth had sand added to create texture. 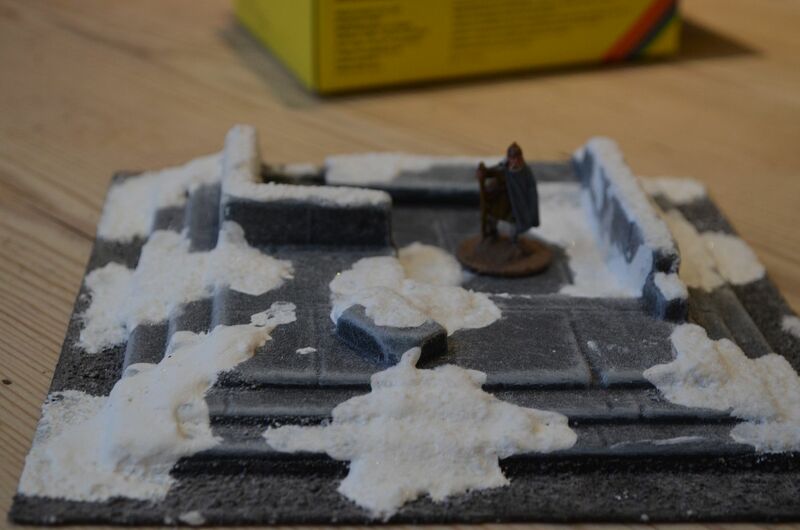 I also started to build up some sand/snow areas inside the walls. The building was then drybrushed with greys to bring out the details. 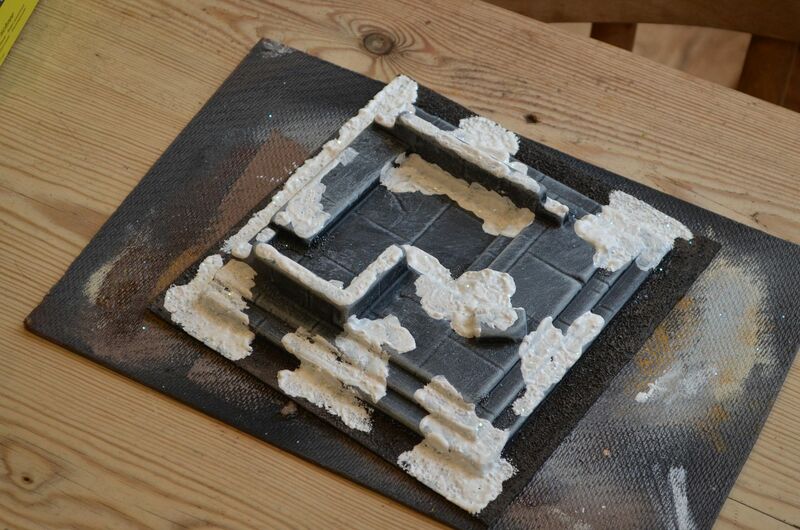 Once dry I added my snow gloop...this consisted of white acrylic paint, pva glue and white powder filler. This was mixed up in a paper cup. The ratios were about a third of each. This gloopy stuff was painted onto the ruins in two successive coats. This took an eternity to dry, but I was still not happy with the final result. 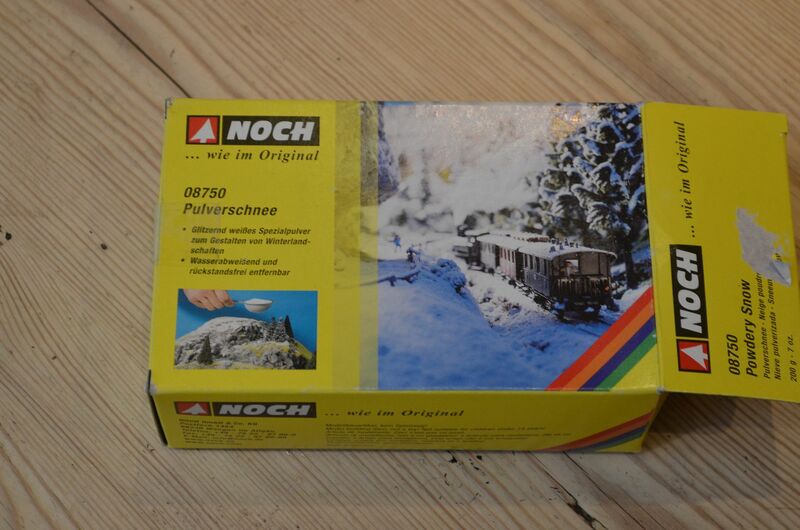 I then recalled I had a box of this hidden in the shed and wondered if this might deliver a better effect? I painted over the white patches with PVA and sprinkled on this white powder. It was perfect. Onto the next piece - this focuses on the rather wonderful Gormiti Plastic Toy called the Earth Temple - it comes in some various shades of garish brown and orange. I picked up mine for a tenner on ebay. Subsequently I bought two more ! - One will be sold once finished for hopefuilly a tidy profit. 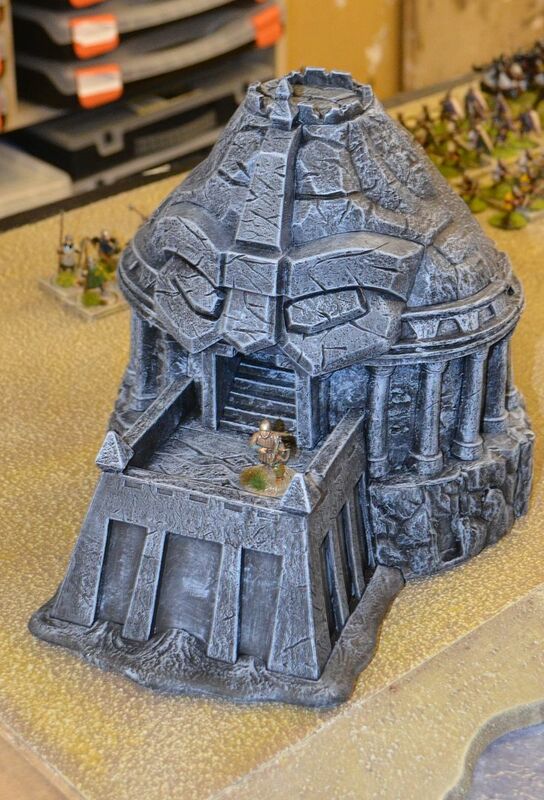 These buildings are perfect for 28mm Fantasy games. the best snow effect I have seen and use is a an extremely fine grain. It is used to sandblast metal sheets. I got 15 kg for £10 from a sandblasting firm. It is a bit more fine than fine salt and has a discreet shine to it like you see on real snow. Eric, you've done it again! Wonderful work there, well done that man! First part of my Frostgrave order arrived !